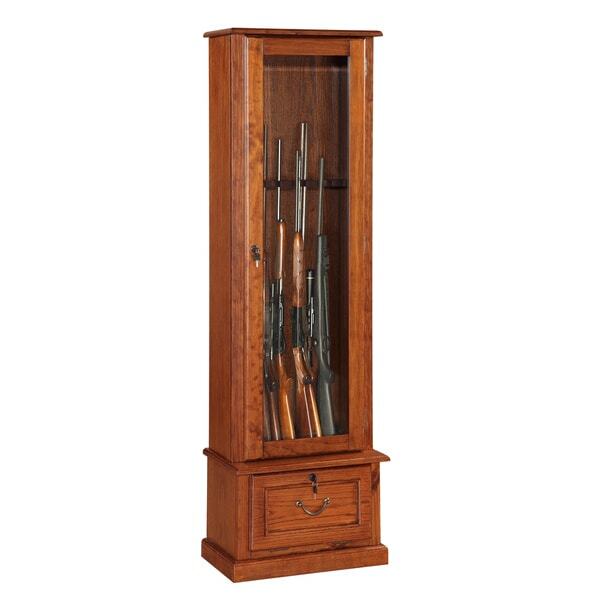 Show your guns confidently with this glass-door display cabinet. Made of solid wood, it features a sturdy lock and tempered glass windows to exhibit your collection with safety and elegance. Felt lining on the bottom and barrel rest guards against scuffs and scratching, making this cabinet an ideal way to keep your guns in top condition and safe from accidental access. The imposing height and rich wood-tone finish of this display cabinet make it a compelling addition to traditional or rustic decor schemes. Use it to show off your collection in a library or recreation room, or simply store it near at hand for safety. This gun cabinet looks exactly like it does in the picture. The wood has a very nice finish and color. 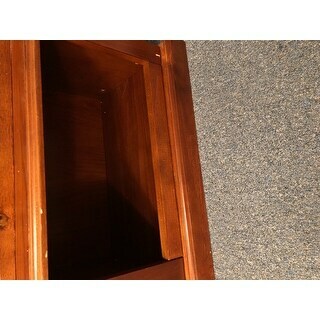 The back is extremely thin which somewhat defeats the purpose of a locking cabinet. If you're looking for a nice display and a deterrent for children then this is a good choice. If you're looking to keep firearms safe and secure I recommend a safe. Box it came in badly damaged with one end open,wood around glass door gouges and scratched,bottom storage the wood is also scratched with some gouges.Does not hold 8 guns holds 6 nicely.Not happy with this gun cabinet. We purchased this gun display for our camper to fit in a small corner and hold our 6 guns. It was a little difficult to install and the glass door is slightly crooked, but otherwise it is well constructed for the price and has served our needs. Wood was scratched and has a flemsy back panel instead of solid wood. But for the price it will work. This product looks great in our game room. It was easily constructed and very sturdy. The final product looked just as the picture showed. This is a nice gun cabinet but when we received it there was hand written measurements on one of the pieces. Sooo easy to assemble and my husband loved it! We liked the fact that it had a small door area to hold all the ammo. Can't go wrong with a lock and key gun case! This is a beautiful gun cabinet for the price. Can't go wrong. Easy to assemble and good quality. A must have for the man cave. The front door was broken. Called company and they cannot replace it until maybe February 2019. Very disappointed. Would not recommend to anyone! Not very sturdy. Took both me and my husband to put together. Just looks cheap but it serves it's purpose. This is pretty nice cabinet. It’s heavy and sturdy and nicely built. Good quality. I bought it as a gift, so if that changes, I’ll update the review. "Is this solid enough to add shelves to? I plan to use it as a liquor cabinet, not for guns"
Yes, this is solid enough to add shelves. "Why is this same cabinet cheaper everywhere else? Menards, Cabella's"
"Is this gun cabinet assembled or do i need to do that"
Hello katrina, this will require assembly. Thanks for shopping with us!